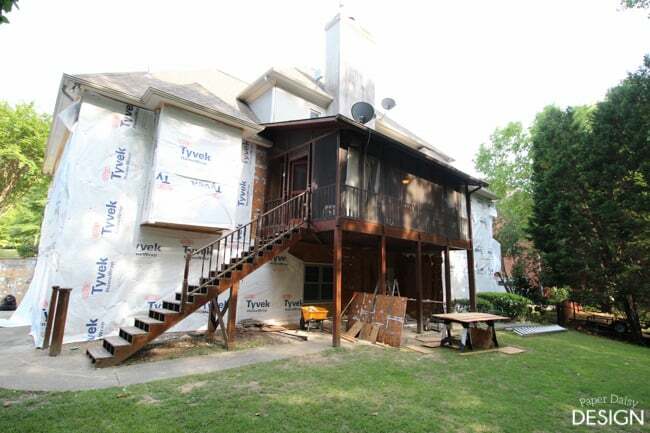 Things are progressing here at the Trail House. This week the focus has been mostly on the outside. 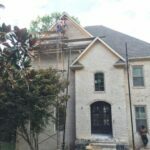 The mason is scheduled to pour footings for the brick in the next day or two, making it imperative that we get the Dryvit off and out of the way this week. 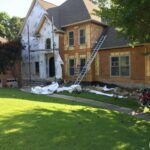 The guys have been making their way around the house, removing the Dryvit and wrapping the house with weather proofing as they go. 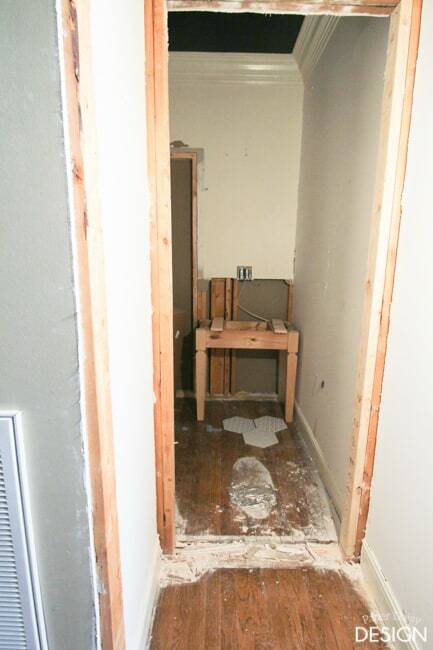 So far we have not had as much rot/water damage as expected. 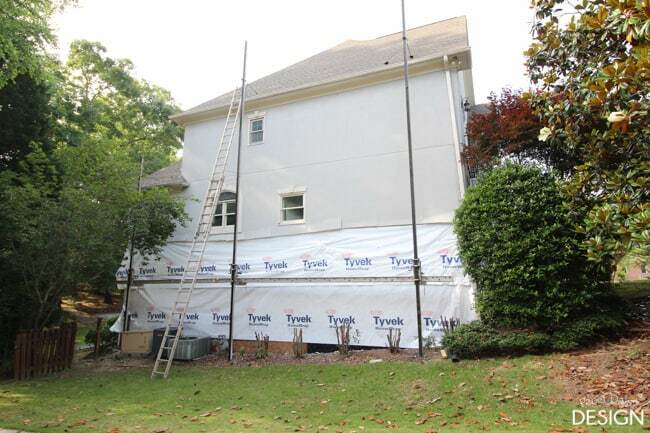 This is a huge relief although the worst areas, the chimney and the front, have not fully been revealed. 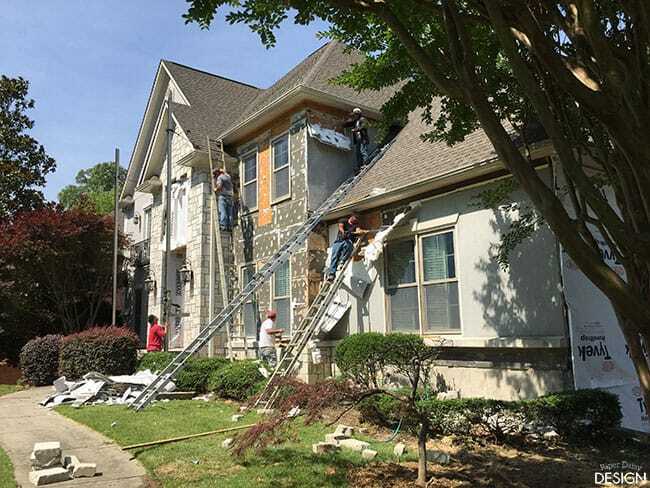 The thing about Dryvit is that if water gets behind the outer sheathing there is no way for it to get out. 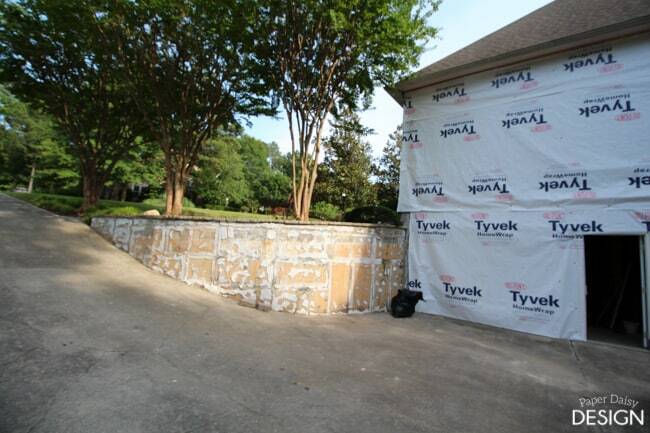 When Richard removed the Dryvit from the retaining wall, water literally gushed out from behind the styrofoam. 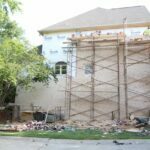 It amazes me that even with the visible cracks in the Dryvit, the actual structure of the retaining wall remained sound. Proper weep holes will be added when this area is bricked. This is what the front of the house looked like this morning. And by the end of the day, the Dryvit was completely off and only the bottom portion of the stone remained. The stones are extremely heavy and surprisingly, the stones vary greatly in depth. While they have been carrying them to the backyard for re-use on a patio, it will take some planning to be able to use them as we had intended. I’m not saying it won’t work, but it’s one of those cases where we will have to wait and see. Moving inside, Richard pulled out the hardwood and the tile basin from under the washer and dryer area in the laundry room. Tucker, our goldendoodle is quite the water dribbler and since his bowls will be kept here we felt like long term, tile was the more durable choice. I also disliked the look of a small bit of tile sticking out from under the utilities. 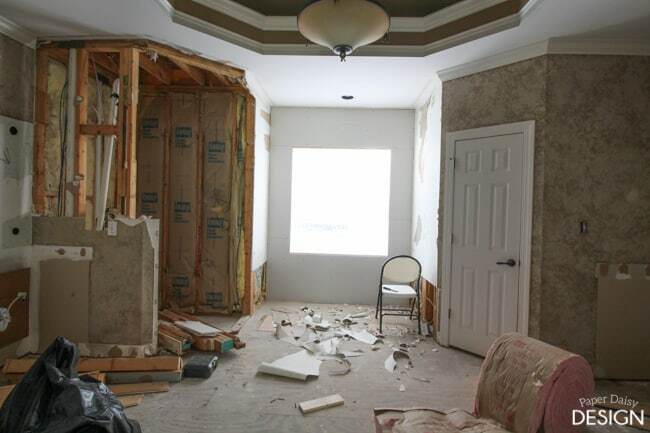 Other than this bit of demo, it was nice to see less “tearing things up” and more “putting things back” this week. The master bathroom saw the window being framed up and drywall hung. 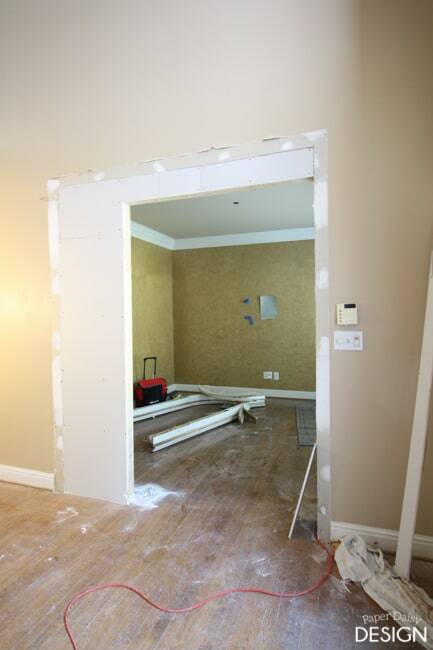 The study now has drywall in preparation for the antique doors. 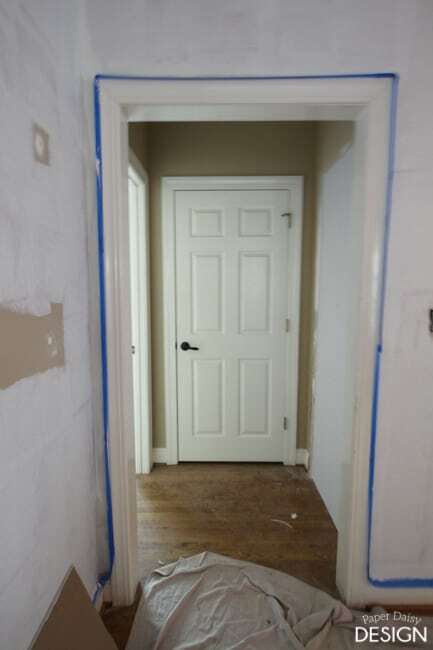 Previously, these doorways/openings in the foyer had three different heights. It looked choppy and ill-planned. I am very happy about the way this is coming together. 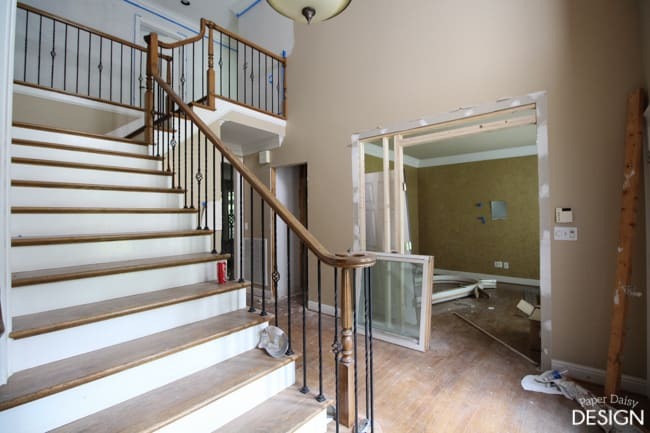 Creating at least two equal sized openings is something relatively subtle, but makes the space more cohesive and more architecturally appealing. This weekend Richard and I built a small table to hold a new vessel sink for the powder room. And if you look closely you get a little sneak peek at the tile going in here. Today, I started removing the thin layer of paper, left from peeling off two layers of wallpaper that had been painted, from these walls. 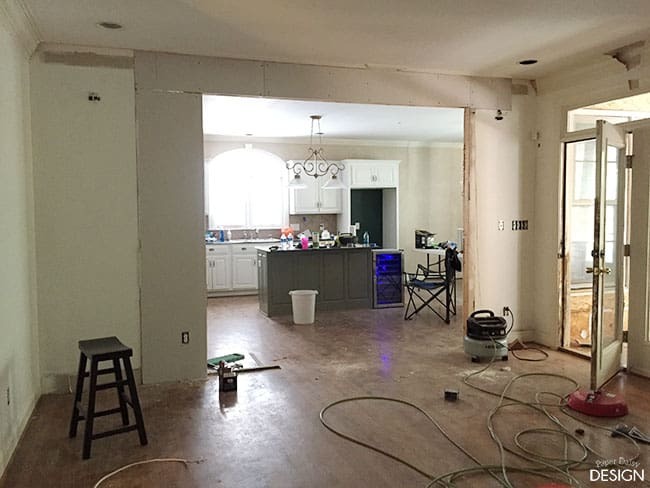 We still need to hang the rest of the drywall on the opposite side of the kitchen, but this wider opening and view from the kitchen is a major improvement. Upstairs, I finished painting the landing area of the foyer and completed the areas that needed touch-ups in the rooms too. 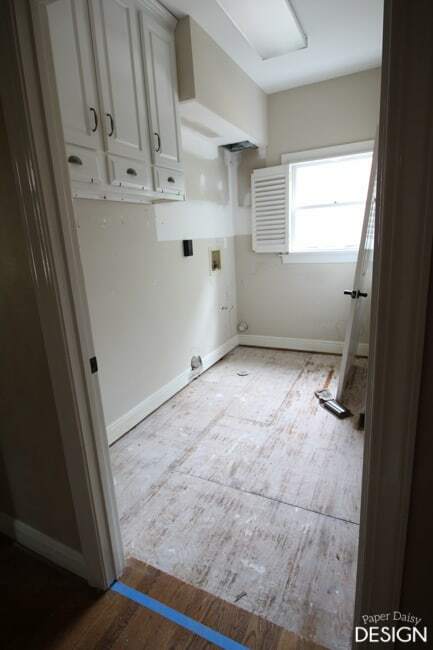 Hopefully, wood floors will be installed within the next two to three weeks. 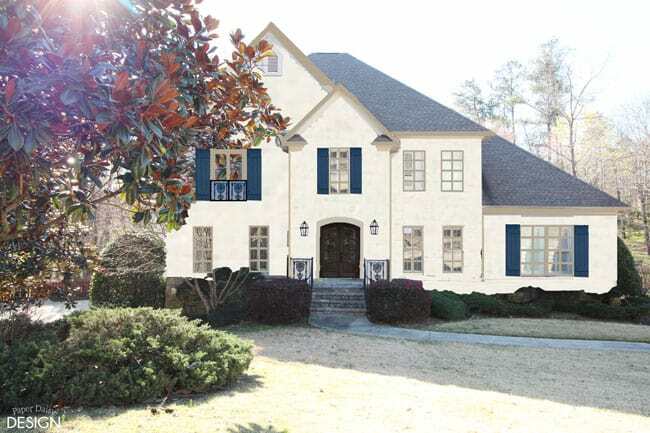 As far as the design plans I promised, I’ll leave you with this rough rendering of the front of the house. 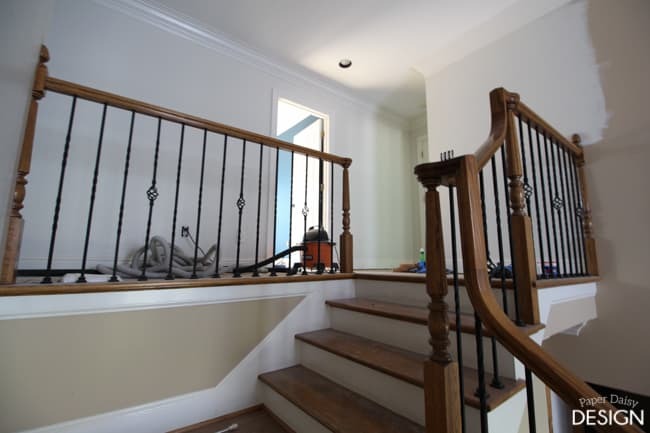 The existing wrought iron railings inspired the small tweaks to the design. 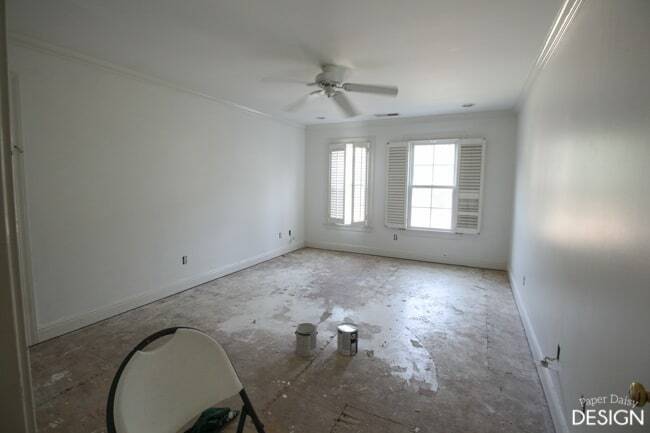 My goal is to create a more southern style home, a nod to my Louisiana roots. I’ll go into more detail soon. 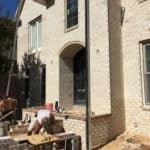 The brick I chose is called Woodhaven Tudor by General Shale and when an ivory mortar is used it gives the appearance of a painted or lime washed brick, a look I have always adored. 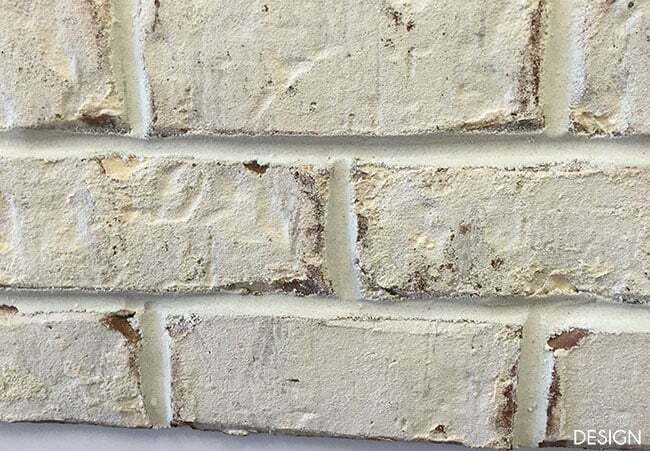 And honestly, I don’t think our mason would have agreed to work for us if I had decided to actually paint the brick. He was clearly mortified when I told him of my initial plan. This is probably a better choice in the end because it will not need maintenance. That pretty gets you up to speed on where we stand. 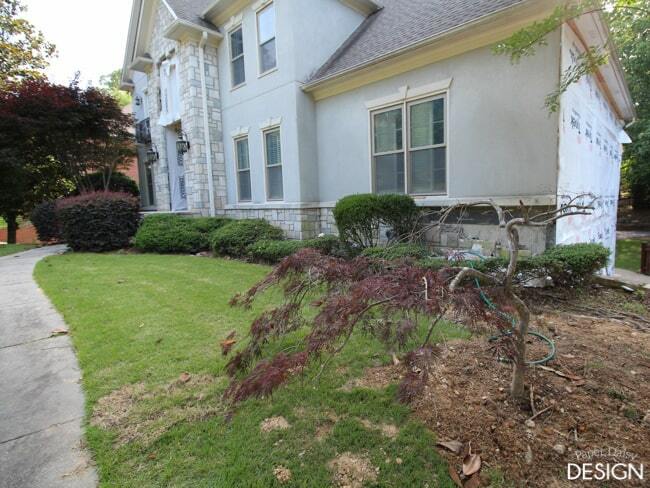 If we could have a little mascot for the reno, it would be this weeping or lace leaf maple. It was struggling to survive in the backyard due to lack of sunlight. I imagine when it was planted the trees provided less shade to the backyard. So when the bobcat was here a few weeks ago leveling the patio area in the backyard we took the opportunity to move the sad little tree to the front where it can get the perfect amount of morning sun. The guys check it daily to see how it’s doing and someone turns the hose on it. Obviously, it’s going to need some time to return to it’s full potential, but given the value of these trees, especially of this size, it was a worthy endeavor and kind of fun to have something special to care for in this mess. If you need to get caught up on the previous weeks and video tour you can go here.